After falling in love with the amazing BB Creams, I turned my head and got curious when the newer version called CC Creams entered the market. I of course wanted to try it out, because I thought it's the more advanced version of BB Creams. Yes, this is my first time (finally!) trying a CC Cream. I've heard about this TonyMoly Pure Aura CC Cream for a while and when I saw it at KoreaBuys website I was so excited. As you can see above, I got 4 items from KoreaBuys and I have reviewed the rest of the item on my previous posts. 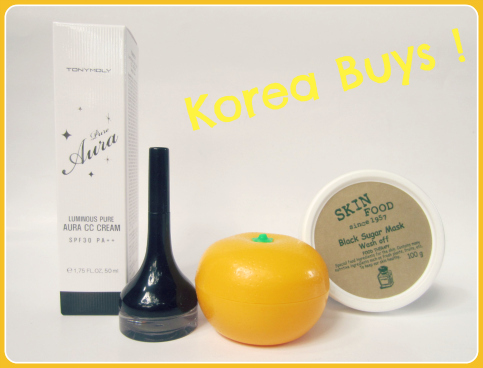 Aside from this TonyMoly Pure Aura CC Cream I also got the TonyMoly Backstage Eyeliner, TonyMoly Tangerine Hand Cream, and Skin Food Black Sugar Wash-Off Mask. I previously mentioned that I first thought that this CC Cream is the new more advanced version of BB Cream. Well, it turned out that I might be wrong. Actually, this is just my personal opinion. I personally wouldn't say that CC Cream is a more developed version of BB Cream because I learned that they are both actually different. While BB Cream stands for Blemish Balm Cream (to cover blemishes), CC Cream stands for Color Correcting Cream (to correct skintone). So that is the basic difference of the creams. Although both of them boasts the same core which is a "makeup + skincare in one" but they have different main functions. One is for coverage, and the other one is for correcting skin tone. Both of them has skincare infused in them, but CC Cream is infused with more skincare than BB Cream so yeah you might say that CC Cream is an advanced version of BB Cream in terms of skincare. As I told you above, BB Cream is mainly for covering blemishes so they have medium to strong coverage, while CC Cream on the other hand doesn't really have coverage, they mostly only have mild to medium coverage. What CC Cream does is correcting your skin color so it would even out your skin from redness, etc. But CC Cream usually have more developed skincare in it, for example this TonyMoly CC Cream has sunscreen, whitening effect, wrinkle repair, brightening and moisturizing properties, as well as functioning as primer and makeup base. Quite amazing, right? According to the TonyMoly information that I gathered, this CC Cream is an all-in-one cream with the ability to change color matching to your own skin tone as soon as applied on the skin, to offer an innocent and gorgeous look to bare skin. It is an all-in-one cream that creates smooth and moisturizing skin, it takes care of makeup and skincare at the same time with moisture that remains for hours. For those of you who would like to know about the ingredients, you can click the photo below to enlarge it. It has a high sunscreen properties which is: SPF 30 PA ++ ! And it also has pink flower complex that delivers nutrition to the skin to turn dull skin to gorgeous. These black dots are supposedly the color changing agent that would spread and disperse, and adjust itself to our skin tone, thus correcting our skin tone. 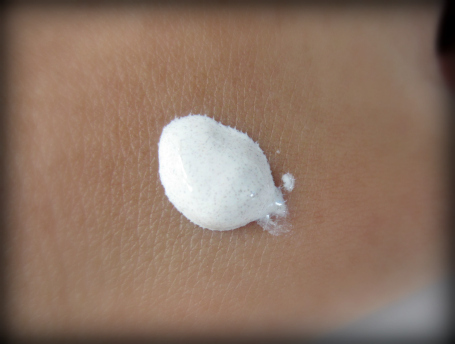 As you can see from above photo, the part where I put on the CC Cream looks luminous, but it looks like it accentuates the pores on my skin, so if you have big pores you might want to use a pore refining lotion or another primer before using this CC cream. And because it has high SPF in it so it tend to show a little bit of white cast to it, but it's still in acceptable level, nothing that makes you look weird or anything like that. In the photo above, the left one is the BEFORE photo and the right one is the AFTER photo. I hope you can get the idea of how much coverage it has. 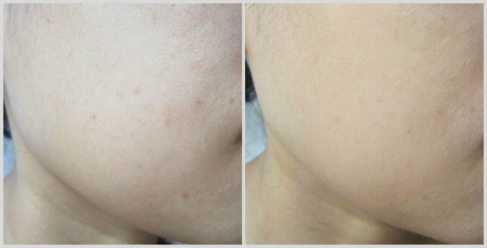 On the left picture I had a couple of redness spots as well as little dark spots near the middle of my cheek, and on the right picture after using the CC cream my redness are instantly gone and my little dark spots are less visible. 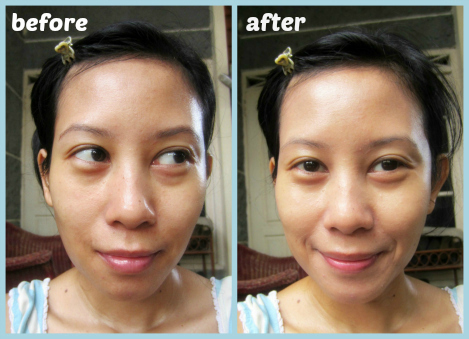 My skin is also smoother and more even-out after using the CC cream. Second of all, this is when I just put on the CC cream so it hasn't been absorbed fully by my skin. Meaning: you can see that it still look somewhat overly white in this photo, but believe me, a few minutes later it blends in well with my skin tone and it's not overly white anymore. See? it blends in pretty well after a few minutes, right? You can see that I have an overall dull appearance and several tiny imperfections all over my face before I put on the CC cream. And after I put it on, my face looks glowy and smooth and somehow looks like I have natural healthy skin, LOL. Thanks for sharing this blog post! :) maybe we could follow each other on Bloglovin and/or GFC, Facebook? "It has a high sunscreen properties which is: SPF 30 PA ++ !" 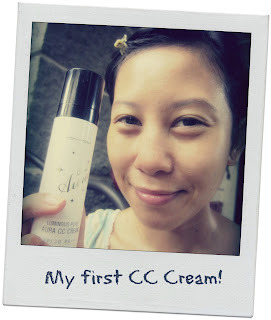 My sister, please follow me back ..
Oh my..This CC Cream is very nice! Your skin looks brighter and smoother. What's your opinion about CC and BB Cream? Who's the winner? @Shasha: Thank you Sha! Yang Rachel K malah aku belum pernah nyobain, denger2 bagus juga ya itu..
@KStylick: Thanks a lot dear! @DreamyPrincess: thanks for letting me know about the kakao talk. As for me I really like them both but for the mean time I would prefer a bb cream because I need more coverage on my current skin condition, LOL. But CC Cream is great for daily use when I don't want a coverage. @Nurina: Gimana yang CC Cream face shop, bagus juga nggak hasilnya? @Adeline: Hai Adeline, kebetulan kulitku kombinasi oily dan di aku sih cocok-cocok aja. Nggak bikin break out ataupun jadi tambah oily atau oxidized. 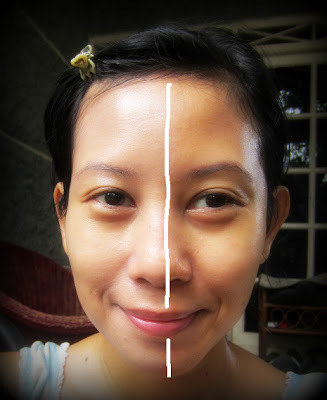 Untuk menghindari break out yang penting bersihinnya aja yang musti bener2 bersih (kalau perlu double cleansing alias dibersihin dengan makeup remover + face wash biar benar2 bersih). i just wanna ask... is it ok to use bb cream as base then cc cream after? Mbak beli di Korea buys berapa mbak?? Korea buys asli kan mbak? ?